Southern Photo has been Brevard's and Central Florida's camera store of choice for almost half a century. Founded in 1963, they have been selling cameras and gear to professionals, artists and hobbyists alike while providing the best service and knowledge to their customers. 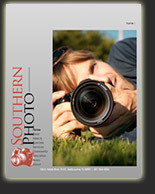 With a new clean, streamlined, well-organized, modern look to their website, Southern Photo hopes to extend their high level of service to the Internet. Check out the new site and see everything they have to offer by clicking here. 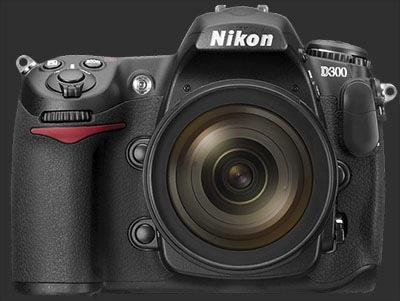 Nikon has released firmware v.1.02 for its D300 Digital SLR. The D300 has two different sets of firmware, A and B. This download upgrades the A firmware to version 1.02 only. This firmware resolves an issue which, in rare cases, causes vertical bands to appear in images captured at shutter speeds slower than 8 seconds. To confirm your cameras current firmware version, press the MENU button and select Firmware Version from the setup menu. The camera's firmware version will be displayed. To download for Macintosh OS X, click here. To download for Microsoft Windows, click here. Nikon is pleased to announce the revolutionary Nikon D3 professional Digital SLR that defines a new benchmark in professional photography. The D3, the result of years of development and feedback from professional photographers, combines many innovative Nikon technologies. These include an exclusive 12.1 effective megapixel FX format (36.0x23.9mm) image sensor with 12-channel read out, a blazing-fast 9 fps frame rate, expandable ISO settings from 200-6400, a completely new 51-Point autofocus system, a 3-inch VGA LCD screen with Live View and a cutting-edge image processing system. The EXPEED image processing system is at the heart of the D3’s ability to capture and process massive amounts of data at high definition. 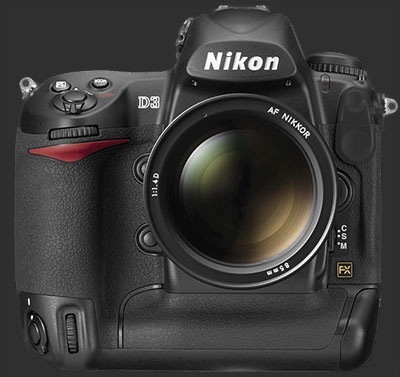 The EXPEED system includes both hardware and years of Nikon image processing experience. The D3 EXPEED system features 14-bit analog-to-digital (A/D) conversion with 16-bit image processing, both of which contribute to delivering results with Nikon’s signature ‘look and feel’ of rich accurate colours, smooth skin gradations and exceptional detail. The image quality of the D3 is combined with outstanding frame rate options. At 9 fps, the D3 is the world’s fastest full format D-SLR1, with an even faster 11fps2 consecutive shooting possible in DX crop mode. A second crop mode is also premiered in the D3, with 5:4 (30mm x 24mm) aspect ratio. Shutter release time lag is an imperceptible 41 milliseconds (CIPA standard), while the image sensor’s integrated high-speed 12-channel readout contributes both to burst speed and Live View performance. The D3 also gets to work quickly; startup time is just 0.12 seconds and mirror black out is only 74ms. Nikon pioneered wireless image transmission. Now, with the new Nikon Wireless Transmitter WT-43, the era of the multi camera network has arrived. Not only can one transmit images to servers and remotely control the camera from afar, the WT-4 also enables remote browsing of the camera’s image thumbnails as well. In a wireless environment, networks of up to 5 D3 and D300 cameras can be established. At a sports event, for example, photo editors could browse all thumbnails on each camera simultaneously, selecting the images they need, while the photographers continue shooting. The D3 body measures 159.5 (W) ×157 (H) ×87 (D) mm and weighs 1,390 grams including battery. It will be available in Europe from November 2007. Nikon UK is pleased to announce the D300 digital single lens reflex (D-SLR), a camera that sets new standards of compact professional performance. The easy-to-use DX-format D300 offers outstanding image quality, multi-functional technologies and fast response. With class-leading 12.3 megapixel resolution, speedy 6 fps frame advance, self-cleaning sensor unit and high definition 3” VGA LCD display, combined with Nikon’s legendary durability, the D300 is a breakthrough solution for photographers searching for an advanced compact SLR. The D300 is loaded with the latest professional technologies designed to produce images of the highest quality. The high-resolution 12.3 MP DX format CMOS sensor generates image files suitable for almost every type of output, combined with a fast standard frame advance rate of 6fps (up to 8 fps with optional Multi Power Battery Pack). The D300 offers fast power-up, quick response and outstanding flexibility to meet the needs of a wide variety of photographic assignments. The D300 powers-up in just 0.13 seconds, with an almost imperceptible 45 millisecond shutter lag. The D300 boasts a self-cleaning sensor unit, which vibrates at high frequencies to remove any loose dust on the surface of the sensor’s optical low pass filter. The camera has a broad ISO range from 200-3200 plus Lo 1 (the equivalent of an ISO 100) and Hi (ISO 6400 equivalent). Image accuracy is also enhanced by the new Nikon Scene Recognition System, which uses the acclaimed Nikon 1005-pixel RGB colour sensor modified to recognise subjects’ shape and position before the image is captured. This also aids the new 51-Point Autofocus system in tracking subjects by their colour, while enhancing the accuracy of exposure and white balance metering. The D300 also offers Live View, which presents photographers with a live image on the LCD screen, with two modes suited to either hand held or tripod shooting. Autofocus is possible in both Live View modes. The EXPEED image processing system is at the heart of the D300’s ability to capture and process high definition image data so quickly. The EXPEED system includes both hardware and years of Nikon image processing expertise. The D300 EXPEED system features 14-bit analog-to-digital (A/D) conversion with 16-bit image processing, both of which contribute to delivering results with Nikon’s signature ‘look and feel’ of rich accurate colours, smooth skin gradations and exceptional detail. The D300 is completely high definition. From the 3-inch VGA LCD screen with 170-degree viewing angle, to the HDMI interface for HD ready displays, the D300 is ready for tomorrow’s imaging environment. The controls of the D300 were designed for ease of use, with an easy-to-view top LCD panel and an information display on the rear LCD screen that can change colour according to the ambient lighting conditions. The totally intuitive 8-directional multi-area selector makes selecting any of the 51-Point autofocus settings simplicity itself. The D300 continues Nikon’s long tradition of sturdiness and durability. The camera body is built from a magnesium alloy, while the camera’s shutter has been tested for 150,000-release cycles. The D300 is also designed for a high level of dust and water resistance. Like the D3, the D300 isn’t just a camera, but part of a complete Nikon system to help photographers create great images. The D300 is compatible with the Nikon Total Imaging System of NIKKOR lenses, Speedlights, accessories and software that provides a complete solution for any photographic challenge. One accessory that can extend shooting life, add ergonomic vertical shooting practicality and increase frame rate to up to 8 fps* is the MB-D10 optional Multi-Power Battery Pack. The compact MB-D10 simply attaches to the base of the camera. Unlike other grips, the MB-D10 does not occupy the camera’s battery space, so one can shoot with two EN-EL3e batteries, or add a powerful EN-EL4a battery into the mix. The D300 and MB-D10 can also be powered by AA size batteries as well. *Requires EN-EL4a. Nikon pioneered wireless image transmission. Now, with the new Nikon Wireless Transmitter WT-43, the era of the multi camera network has arrived. Not only can one transmit images to servers and remotely control the camera from afar, the WT-4 also enables remote browsing of the camera’s image thumbnails as well. In a wireless environment, networks of up to 5 D300 cameras can be established and image thumbnails from all connected cameras browsed simultaneously and relevant image files pulled, while the photographers continue shooting. The D300 body measures 147.2 (W) ×112.8 (H) × 74(D) mm and weighs just 795 grams. Nikon is pleased to announce two zoom NIKKOR lenses designed to maximize the potential of the advanced new FX format D3 digital SLR camera launched today. Fully compatible with existing DX-format Nikon DSLRs as well, they share fast f/2.8 apertures across the zoom range. 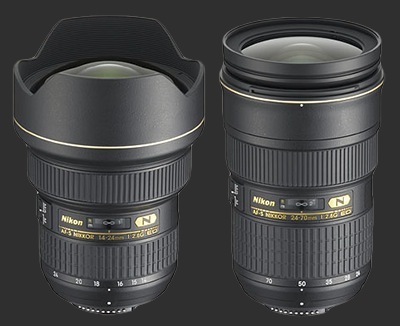 The ultra wide-angle AF-S NIKKOR 14-24mm f/2.8G ED and the slimline AF-S NIKKOR 24-70mm f/2.8G ED, are designed for the exacting optical demands of professional use. The ultra wide-angle/fast aperture combination of the AF-S 14-24mm f/2.8G ED lens is a world first*, and is highly adaptable for the tight spaces busy professional photographers often find themselves working in. The excellent optical quality of this 14-24mm lens, combined with excellent levels of detail contributes to brilliant, sharp results. Both lenses share Nikon’s unique Nano Crystal coat technology to minimize ghost and flare, with ED glass elements contributing to outstanding levels of resolution and contrast. Nikon’s precision Silent Wave Motor assures fast and quiet autofocus performance, with instant manual override possible. Both lenses are designed with high dust and moisture resistance, and include a rubber seal around the bayonet mount. - The AF-S 14-24mm f/2.8G ED measures 98×131.5mm and weighs approximately 1,000g. - The AF-S 24-70mm f/2.8G ED measures 83×133mm and weighs approximately 900g. - Each of the new lenses comes with a flower-shaped hood and a semi-soft case. - The hood of the 14-24mm is integrated, the 24-70mm removable. - Prices to be revealed in September. - Both lenses will be available in November 2007.